Would it be possible to add a scroll bar to the deck manager? I'm running into an issue where I cant save any more decks because the final deck is overlapping the save and import buttons at the bottom. The interface was quickly thrown together, but in the overhaul I'll be doing soon all of those things will be addressed and you'll have a nice and functional interface as well. 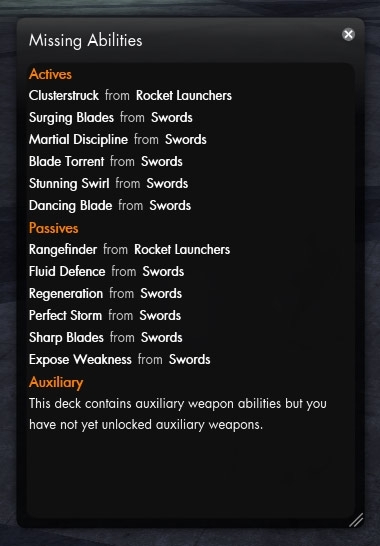 Is it possible to make loading decks by double clicking in menu? It's possible that will happen in the overhaul that's upcoming. After the 1.1 update, I cannot get this to work. I followed the directions and placed the .xml and .swf files in the \customized\flash folder. I also placed the script in the \scripts folder. The icon no longer shows up on my top bar and when I type in /vdm all I get is "Changed variable <Viper_DeckManager_SlashCommandHandler> from <false> to <true>. 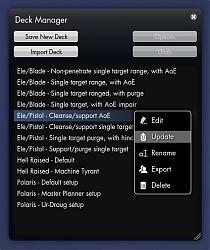 Deck Manager no longer shows up after I decided to restart my client yesterday. Have you tried using the /vdm command to bring it up? Make sure to have installed the "vdm" script file correctly into \The Secret World\Scripts\ for that to be possible. If that doesn't work either it's likely some XML/location issue where it doesn't get loaded because the files aren't located as per the readme.txt (or left-over XML entries from \Customized\ are present). Feature request: re-orderable list! I'd like to be able to drag builds up and down the list to reorder it. 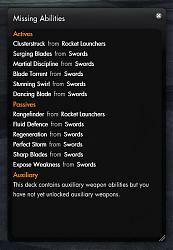 I've racked up quite a few decks from testing decks and multiple roles. 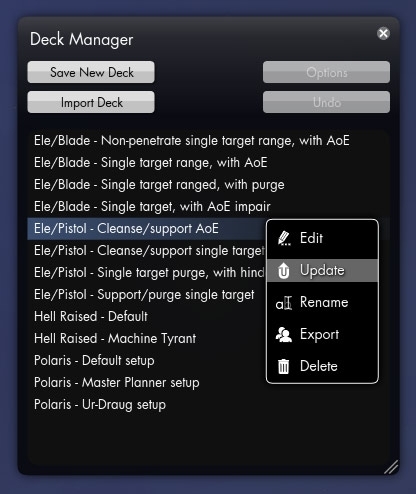 The huge overhaul of DM will probably not include manual sorting, instead you will have the ability to create categories for decks and various other things that will help sort/locate decks. It will be a top priority to make DM much easier to deal with in terms of usability. I've run into an annoying and all too reproducible bug. I'm not sure if it's in Deck Manager or in the TSW Client. My current character is a Templar so I put together all of the Illuminati decks using http://www.drakkashi.com and imported them into Deck Manager. I can load them fine but when I try to reload my regular solo build I'm told that I already have an elite passive slotted. The only way to fix this is to relog. I believe the issue is that I have not yet purchased the elite passive in the Illuminati deck that I'm loading. Deck manager appears to leave the slot empty as expected but as stated above I am unable to put any other elite passive into the slot afterwards. The new version will contain safeguards to check for these things, so it should be a non-issue once the major rework of DM hits. Had a rather strange occurrence today Viper, and was wondering if you could shed some light on it. When I logged in today, without changing any settings or mods or what not, I found that the Deck Manager icon had just randomly disappeared. Not only that, but the Castbar Relocator icon had been moved from it's default position by the compass to being right beside the MENU text and overlapping the MENU's default icon on the left. I checked to make sure the XML files were still correct, they were. Then attempted to remove and reinstall all my addons, no luck. Not sure what's going on, but it's really boggling my mind. Edit: After some testing, I found that the icon is still there, just now overlapped with the MENU icon and the castbar icon, all in one giant, overlapping pile. I have no idea what's happened. Yeah, I'm hearing quite a lot of this. My assumption is that it happens because my add-on gets loaded before the compass (for some reason) and then they of course can't hook to the compass as it doesn't exist yet. I will however fix this in an entirely better way, possibly tomorrow - but let's see. Last edited by : 07-29-2012 at 09:20 PM.